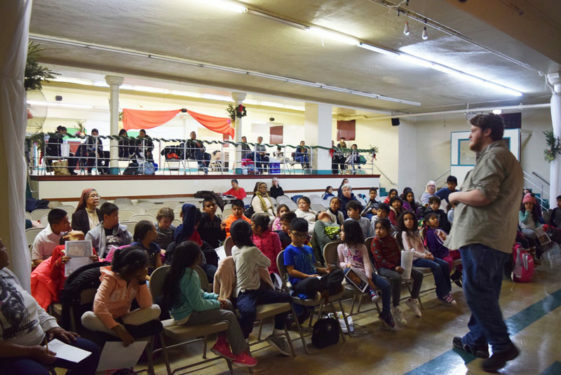 Before all four Advent candles are lit, hundreds of elementary students will have experienced an interactive, lively Christmas tale about finding the courage to ‘love your neighbor’ regardless of color or creed. 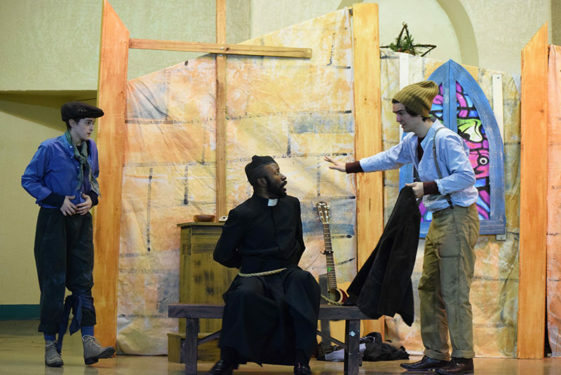 Set in St. James Cathedral in Downtown Brooklyn during the early 1800s, the original tale “Noel: A Brooklyn Christmas Story” toured different parishes around the diocese. 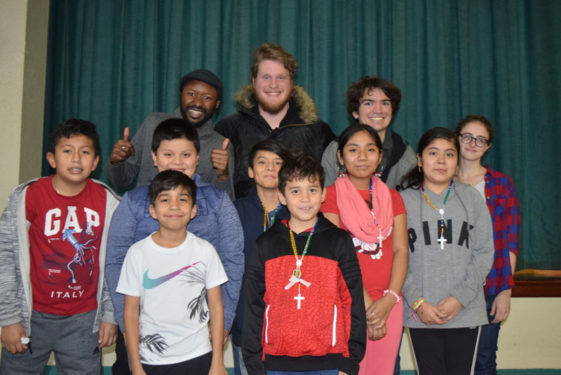 On Wednesday Dec. 13, students from the religious education program at St. Thomas Aquinas-Holy Family, Park Slope, gathered in the parish hall to view a story about a young Catholic Irish immigrant who faces cultural exclusion and religious strife. 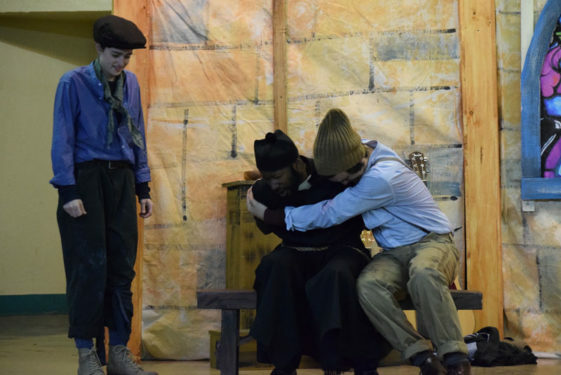 The main characters are Noel, a non-denominational homeless girl from Manhattan, and Patrick, an Irish boy who attended St. James Cathedral where he befriends his fellow Irish-born church leader, Bishop John Loughlin. Brooklyn’s first bishop serves as Patrick’s mentor and confidante. 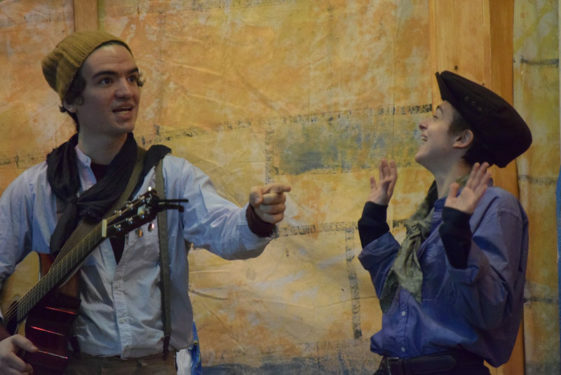 As the curtain opened, students’ imaginations journeyed through a time capsule that took them back to the late 1850s, decades before the Brooklyn Bridge connected Manhattan and Brooklyn Heights. It was a time when an influx of Irish immigrants mixed with mass waves of other European immigrants that transformed Brooklyn into the third-largest city in the U.S. by 1860. Amidst the city’s burst of industrial and economic expansion, cultural disparities created riots between Catholics and a predominantly Protestant society, targeting the Irish population as outsiders. While riots were occurring outside the Cathedral, Noel and Patrick hide inside the church. Though strangers, Noel encounters Patrick’s kindness and humanity when he helps take care of her injury. 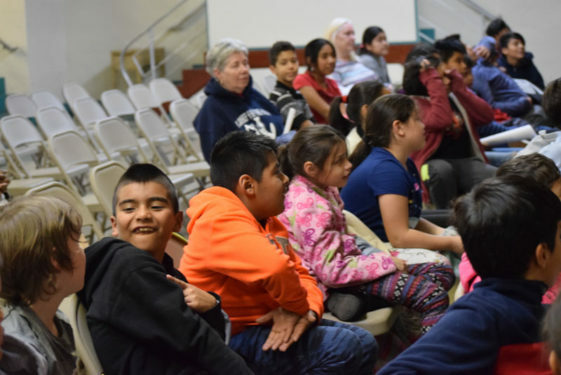 She even learns about different theological topics such as forgiveness and the different duties a bishop oversees to explanations of why churches have stained-glass windows. A complex storyline deals with clashes involving race, religion, and society. 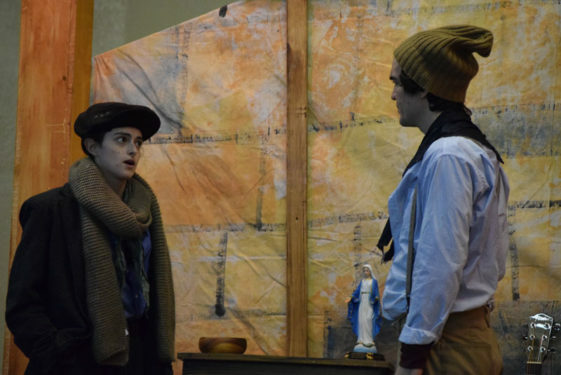 In the final scene, after the characters build a camaraderie, Noel’s vulnerabilities as a homeless kid are exposed, but Bishop Loughlin and an orphanage he runs saves the day. 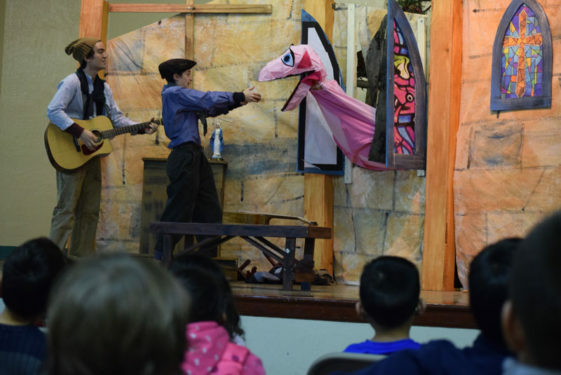 “I love the story,” said parish secretary Dorothy Negron, who worked with Father Jesus Cuadros, pastor, to bring the play to the CCD program. “It’s great for the kids to understand that we’re not learning from our mistakes or maybe we are a little bit, but there’s a lot to learn here for everybody. 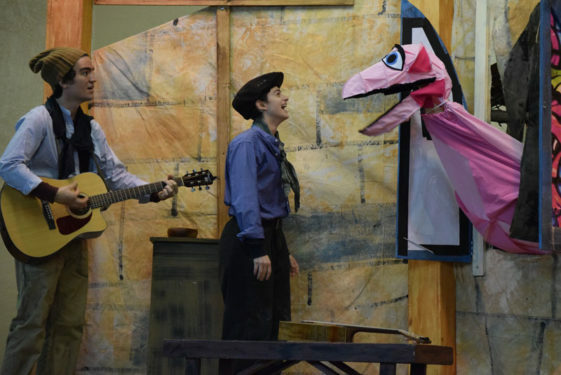 “This kind of show is beautiful for kids, because it’s lively, it awakens their attention,” said Franciscan Sister Hilda Agah, who teaches at the parish. 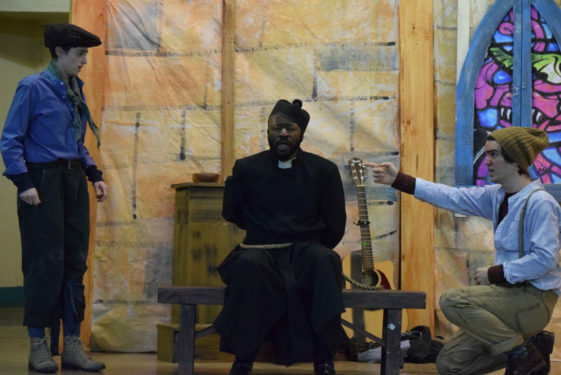 Paris Crayton III, who plays the bishop, said he tried to study the church leader and the anti-Catholic riots of the time. After the play was finished, the cast opened up the floor for a short question and answer session. 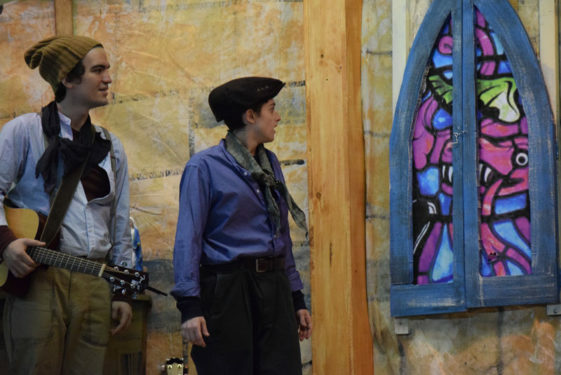 Spencer Corona, who played Patrick, seized the moment to explain the historical background occurring at the time and the moral of the story how everyone should love and get along. Bobé, who attends P.S. 172 Beacon School of Excellence in Sunset Park, received the message loud and clear. “Peace in the world is pretty good,” said Bobé. “I was definitely surprised of the timing of these riots and how close it was to the Civil War,” said Corona, whose grandfather lived in the Williamsburg projects as an Italian immigrant. Q: There’s not too much historical content on Bishop Loughlin. How did you go about finding information about the first bishop of Brooklyn? A: Finding out about Bishop Loughlin – all I could find online was that people liked him and they revered him. No writings on his personality. 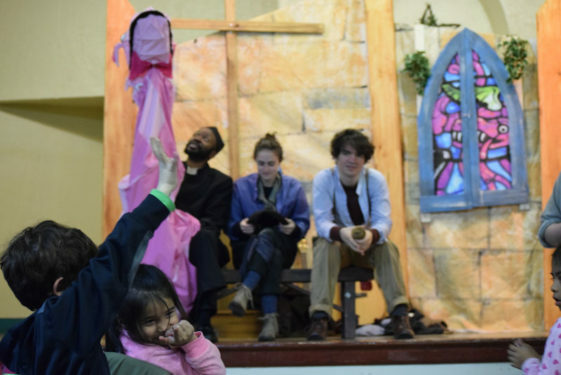 Q: How did the opportunity arise to share theatrical stories with the Diocese of Brooklyn students? A: We’ve been working with the Diocese of Brooklyn for years and we have a pretty extensive residency in a number of schools. We’re in like 40 grade schools in Brooklyn and Queens and a lot of that has to do with the faith of the superintendents knowing that we can address their audience. The Elizabeth Ann Seton Trust has been really instrumental. We continue to branch out to other Catholic dioceses. Q: Did anything surprise you while researching and writing this play? A: Yes. Brooklyn was such a maritime city. The thing that really struck me about researching Brooklyn at that time was how dependent on the shipyards it was. The rioters weren’t even from Brooklyn, I don’t know if that’s clear from the play. But the people that came over to hear the preacher rile them up were from New York and at the time they were two different cities. They were coming over from New York on this ferry to cause trouble. Q: Do you feel any personal connection to the storyline? A: My relatives that lived in New York in the 1850s actually were from Ireland, so I do feel a connection. They came from Ireland and I’m sure they had similar issues being accepted at the time. They lived in tenements and in the census there were 10-12 people in an apartment and there was dozens of families in a building. Q: What’s your definition of success with this play? A: I want them to feel like they’ve worked through an issue, an imaginary issue. I want it most of all to give kids hope that things can work out and by replaying something from the past but in a way that puts them into that situation. If those characters that make choices that seem real to you, then you can relate, so that’s the challenge of the characters and the plot as it develops. You try and take them on that journey and the more into it they are, the more they end up saying, I feel better, I feel more hopeful. That’s the kind of story I want to tell.